Wireless technologies are particularly well-suited to use in remote areas. Canada is the world’s fourth leading producer of natural gas and production is continuing to trend upward, with approximately 5,500 billion cubic feet of gas produced in 2014 according to Canada’s National Energy Board. Additionally, nearly 8,000 new wells were drilled, an increase of more than 25 percent over 2013. The growth in natural gas production – most of which takes place in British Columbia and Alberta – shows no sign of diminishing. Much of this production is taking place in remote, hard-to-reach areas, and that’s why the industry’s wireless revolution is so important. Because of breakthroughs in the development of wireless data collection technologies, operators now have constant access to measurements of flow, level, pressure and temperature in wells in areas that can be difficult to reach. The most important advances, in fact, have been in tools to overcome longstanding challenges posed by the technology’s limited range and difficulties in supplying sufficient power to operate in remote locations. And the benefits of wireless technology extend beyond convenience. These tools can also save operators up to 60 percent in equipment, installation and operational costs. Many engineers even claim that wireless networking is more reliable than hard-wired equipment because it is less vulnerable to physical damage from extreme weather and other factors. Transmitters are now available in two license-free radio bands, 900 MHz and 2.4 GHz that can transmit up to 7,500 feet, which is generally more than sufficient for a wireless well site. For communication between well sites and operators, SCADA applications offer ranges of five miles at 2.4 GHz and 20 miles for 900 MHz. Wireless technologies are particularly well-suited to use in remote areas because these locations aren’t typically susceptible to physical interference. The most common problem when operators try to push the range of their communications equipment is that wireless instruments that operate on high frequencies require near line-of-sight communications. This is not practical in high density areas. Simply put, radio signals don’t bend around buildings, process equipment, terrain and trees. Line-of-sight is less of an issue away from developed areas and out on the open seas. There is also much less RF “chatter,” making interference much less likely, which of course adds to reliability. The open spaces that are commonly found throughout remote areas of British Columbia and Alberta also allow operators to implement single-level, point-tomultipoint network topologies, which are simpler than the mesh topologies that have been designed for high-density locations such as process plants. Since extra network nodes that mesh networks use to route signals around physical barriers are not required, operators also benefit from reduced costs. As promising as wireless technology has always been for remote well sites, power issues tended to undermine past efforts to apply them. Unlike wired connections, wireless equipment must be self-powered and it’s not realistic to plan to travel to wells every few weeks to replace the required batteries. The more wells operators have, the more costly this becomes. However, wireless devices can now operate on tiny amounts of energy, allowing them to run for years with small, inexpensive batteries. New tools such as battery life calculators allow operators to anticipate battery life in order to avoid unnecessary trips to wells to replace batteries. Wireless transmitters have always been well-suited to “slow” processes, such as those requiring one-minute sampling intervals. However, recent breakthroughs in power technologies now permit wireless transmitters to handle much higher update intervals (as high as one second), while operating for many years between battery replacements. The long battery life that is typical among wireless transmitters today will appeal to all process operators, but is particularly important to field operators, who need multiple years of operation between battery replacements. 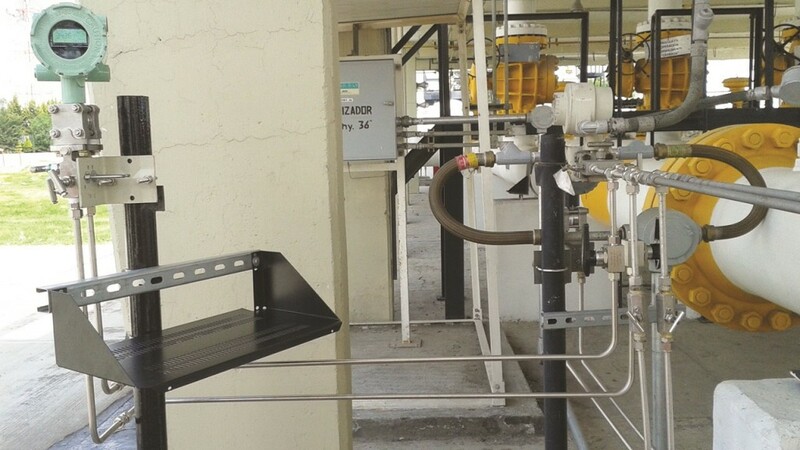 In the past, this has eliminated wireless transmission as an option in remote areas when it comes to dynamic flow measurement and process control applications, which demand frequent updates. However, the dramatic improvements to battery life have changed the landscape, providing new technology as attractive options for most operators. Wireless instruments provide greater access to natural gas operations and sites. As exciting as these developments are, we are merely at the beginning of this golden age of wireless. A new generation of wireless instruments is emerging with even greater power efficiencies, allowing longer battery life even for instruments using one-second update intervals. This new generation technology also features a wider selection of power choices, including solar, which can extend battery life even further. Multivariable measurement has also emerged with differential pressure, static pressure, and temperature sensors in a single wireless instrument. The new generation also broadens applications to the pipeline and gas distribution industries in which installations demand one-second updates and long battery life. For example, wireless instrumentation has previously not been feasible for custody-transfer flow metering applications, which must meet API 21.1 requirements. A wireless API 21.1-compliant “DP/P/T” transmitter, or “MVT,” will operate over a multiple-year timeframe using an internal battery. Custody-transfer metering installations – and upstream applications using similar criteria – can now benefit from the reliability, safety, security, simplicity and sustainability offered by a cost-effective wireless instrument. These same low power breakthroughs can also provide benefits with sensing technology. As with radio transceivers, pressure sensors and temperature sensors in wireless instruments operate on duty cycles that are intended to minimize current draw. For the most popular technologies, such as capacitive sensors, designers have reached the minimum current draw and have turned to other solutions. Piezo resistive technology is the most promising. By using high-impedance sensors, designers have significantly reduced current draw while still realizing the high accuracy that is demanded by custody transfer flow measurement applications. Additional improvements in power management address longstanding issues with lithium batteries, which must be handled with caution because they contain potentially hazardous materials. Special handling and transportation requirements can negate the cost advantages provided by wireless instruments. Otherwise, lithium battery technology is ideal because it packs far more power per unit volume than other technologies. While a lithium battery with 19 Amphour capacity fits in a small, wireless instrument enclosure, a lead acid cell battery with similar capacity would be 14 times larger. A smaller lead acid cell battery requires a charging source such as a solar panel, which requires costly mounting hardware and is at risk for damage, theft and vandalism. However, the new-generation wireless instruments are efficient enough to allow installation of the lead acid cell battery and solar panel within the instrument enclosure itself, substantially reducing risks and installation costs. Wireless instruments are particularly useful to Canadian well operators because they are a more cost-effective, reliable, and simple choice for measuring and transmitting well data, as well as handling dynamic flow measurement. By combining ultra-low power sensing technology with the API 21.1-compliant measurement performance required by custody-transfer users, wireless multivariable (DP/P/T) transmitters represent the future of natural gas well measurement and transmission. Newgate Instruments Paul Mayer is a product manager at Newgate Instruments. Kevin Finnan is a consultant at Newgate Instruments.